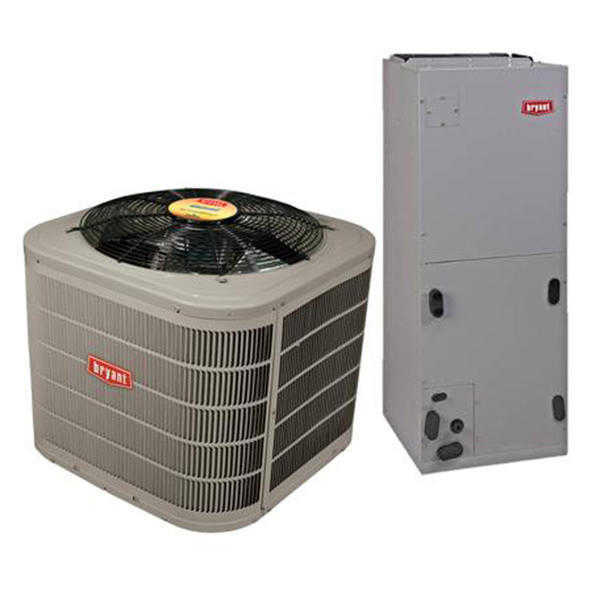 This Bryant Split Air Conditioning System w/ 16 SEER delivers maximum performance using less energy. With a cooling capacity of 42,000BTU, this air conditioning system is apt to cool big spaces using the environment-friendly coolant Puron. With Microtube Technology refrigeration system and a reliable scroll compressor, this unit provides responsive cooling year after year. The air conditioner is protected by a DuraGuard plus protection package that looks good for years while protecting the outdoor coil from damage. This Bryant AC system is equipped with an air handler that combines the technology of Bryant fan coils with Puron refrigerant to deliver high operational performance. The ECM motor enables the air handler to operate at the correct speed to deliver precise airflow. The Microtube Technology refrigeration system with aluminum fin coil maximizes external heat transfer to ensure high cooling efficiency. A filter dryer protects the compressor from contamination and enhances its functioning. This Bryant air conditioning system uses chlorine-free Puron refrigerant to provide comfort and years of energy-efficient performance without depleting the Earth's ozone layer. The Bryant DuraGuard protection package ensures lasting durability and good looks through years of exposure to harsh weather.